As a contribution to the growing body of knowledge and expert guidance on the design and use of outdoor spaces for people with dementia, this handbook addresses the growing need for spaces to be actively used by residents and service users for therapeutic benefit. This handbook resulted from the ‘Therapeutic Dementia Care’ research and design project. In this project, particular attention was paid to the needs of people with dementia and distressed behavior. Hence, the focus is on care environments for nursing, residential, and enhanced day support. Some very good general guidance about gardens and outdoor spaces for people with dementia is starting to emerge. First of all, this handbook takes these environments a step further; the focus is specifically on the therapeutic use of these spaces for beneficial outcomes. Secondly, it draws insight from research and observations by the authors over a period of time, rather than relying on information from owners or operators about their own facilities. Thirdly, this work has a particular emphasis on the environmental needs of people with dementia and distressed behavior. This term is used instead of ‘challenging behavior’ because a person becomes a challenge to others once they are distressed in themselves, and the hope is to keep the focus on the person’s experience. The handbook’s approach is to address the causes of distress using nature as a therapeutic tool, rather than trying to manage or change the behavior solely through care practice indoors. This handbook is aimed at managers, owners and operators of care homes, nursing homes, and day care facilities. It will also be helpful to landscape architects, architects, building developers, commissioners of services for older people, and all those involved in the provision of dementia care services. This handbook is one output of a design and research project entitled ‘Therapeutic Dementia Care’ which was funded by the HIEC (Health, Innovation and Education Cluster) of the NHS in Central Lancashire, UK. Further funding came from Hica who generously supported the author’s work on site at the Lodge, Buckshaw Retirement Village in Chorley. Age Concern Central Lancashire was a partner in the delivery of this project. Sincere thanks go to the sponsors and partners for their support enabling this work to be carried out. The residents and service users whose expert knowledge has largely informed this work are living at The Lodge or at home and attending enhanced dementia day care at Charnley Fold in Bamber Bridge. 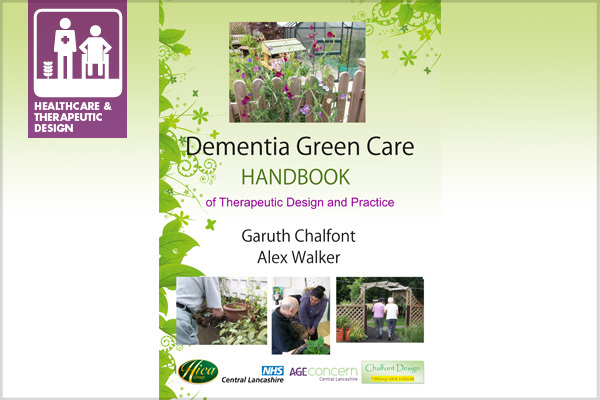 The Dementia Green Care Handbook of Therapeutic Design and Practice, by Garuth Chalfont and Alex Walker, can be downloaded for free online.